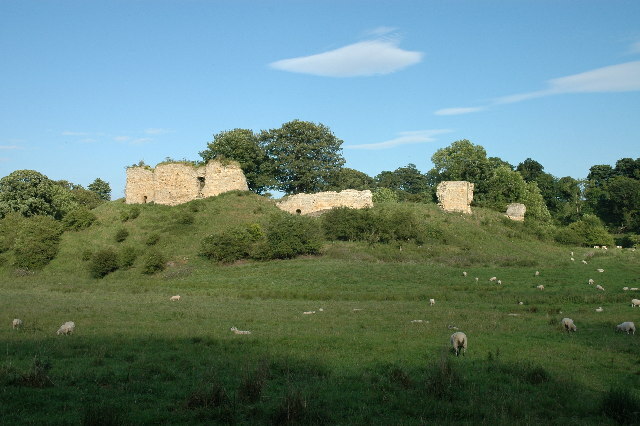 Notes: Mitford Castle is an English castle dating from the end of the 11th century and located at Mitford, Northumberland. It is a Scheduled Ancient Monument and a Grade I listed building, enlisted on 20 October 1969. The castle is also officially on the Buildings at Risk Register. The Norman motte and bailey castle stands on a small prominence, a somewhat elliptical mound, above the River Wansbeck. The selected building site allowed for it be to natural hill scarped and ditched, producing the motte. Mitford Castle was the first of three seats for the main line of the Mitford family constructed on manor lands. Following the destruction of Mitford Castle, Mitford Old Manor House (nearby and to the northwest) was used from the 16th century until the construction of Mitford Hall in 1828. Mitford Hall stands in an 85-acre (340,000 m2) park to the west of the castle ruins.